At Peak Performance Sports, our mission is to help athletes, coaches, and sports parents learn sports psychology strategies for success in sports. You can download a free mental training report to improve your mental game and understand how you might sabotage your own performance in competition. Get started today with a free sports psychology report to improve your mental toughness. If you don’t find your specific sports here, please select “All Athletes” report. In addition, we’ll email you mental training tips to your inbox every week. Once you are in our system, you can unsubscribe at any time. 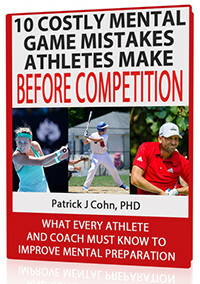 All Athletes: 10 “Costly” Mental Game Mistakes Athletes Make Before Competition – Discover if you are making one or more of these “costly” mental game mistakes prior to competition! 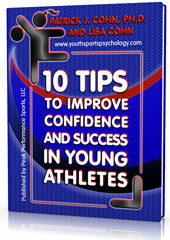 Sports Parents: 10 Tips To Improve Confidence And Success In Young Athletes – Learn The Top 10 ‘Mental Game’ Strategies To Improve Confidence and Success in Sports & Life. Golf: Six Costly Mental Game Mistakes Golfers Make With Their Preshot Routine – Learn Powerful Golf Confidence Strategies Used By Junior, Collegiate, and PGA Tour Winners. Tennis: Six ‘Unforced’ Mental Game Errors Tennis Players Make Between Points – Discover if you are making one or more of these “costly” unforced mental game errors during matches! Soccer: 7 “Costly” Mental Game Mistakes That Block Soccer Players’ Success – Learn the important mental game of soccer skills you need to master to boost your confidence and performance! Baseball/Softball: Six Costly Mental Game Mistakes Baseball And Softball Players Make While Batting – Discover if you are making one or more of these “costly” mental game errors at the plate! Equestrians: 8 ‘Costly’ Mistakes Equestrians Make with Pre-Show Mental Preparation – Discover if you are making one or more of these “costly” mental game mistakes before you (or your riders) enter the ring! Figure Skating: 5 Tips To Help Perfectionist Figure Skaters – Learn why perfectionist skaters under perform in competition, 5 tips to help manage perfectionism, and the top challenges for perfectionist figure skaters. Gymnasts: 6 Perfectionist Mindsets That Sabotage Success In Gymnastics – Learn what gymnasts must know to improve mental toughness. Hockey: Discover 10 ‘Deadly’ Mistakes Hockey Players Make with Their Pregame Attitude – What every player and coach needs to know to improve mental toughness for hockey. MX/Auto Racing: 10-Week Mental Training eCourse – Learn how to explode with confidence in racing!